click the image or link below. NOTE: Acrobat version 11 or higher is required to fill out PDF form. All Metaphase products returned to Metaphase must have an RMA number. PLEASE CALL METAPHASE AT 215-639-8699 IF YOU DO NOT RECEIVE AN RMA NUMBER WITHIN 24 HOURS. 2. Email the completed form to RMA@metaphase-tech.com. Metaphase Technologies will issue an RMA# and email the form back to you. 3. 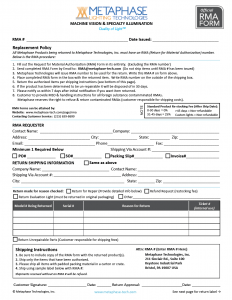 Place completed RMA form (with RMA#) in the box with item you are returning. 4. Write the provided RMA# on the outside of the shipping box. 5. Return the authorized item per shipping instructions.